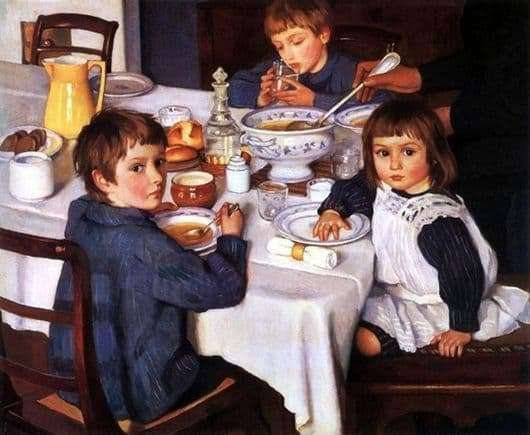 The painting “At Dinner” (another name – “At Breakfast”) is one of the most famous in the works of Russian artist Zinaida Serebriakova. It is known that it depicts the artist’s own children. Mother captured them sitting at the table, waiting for the meal. When looking at the picture we can assume that the children are waiting for dinner, but in fact it was breakfast. From here there is some confusion with the name of the picture. But everything is explained simply: the artist’s family lived then (in 1914) according to the European daily routine. Early in the morning they had a small breakfast, and then, at noon, followed a big one, which in our opinion is already considered lunch. The portrait is written in such a manner that the viewer does not have the feeling that the guys are posing. On the contrary, it seems that they are quite active. This is especially evident in Shurik, who turned around, to look at mom. It is as if he is waiting for her to join the meal too. He himself has already begun to eat soup. His brother, Zhenya, who is a calmer child, is still drinking water. But we see the hands of the grandmother, pouring soup and him. Their little sister, putting her plump handle right on the plate, looks at her mom-artist with a testing gaze. Each of the three children has their own special expression and posture. The guys are dressed in modest, but elegant clothes. You should pay attention to how the table is served. This was done in the noble traditions of the time: a snow-white tablecloth, specially folded napkins, an elegant decanter, a porcelain set. Among the latter, the painted porcelain tureen is especially noteworthy, which creates for the modern man the deceptive impression that the picture depicts lunch. This table setting reminds us of the old days when people’s lives were calmer and more measured. However, there are other, simpler items on the table: glasses, sugar bowl, jug of milk. And when looking at the mouth-watering ruddy buns, we feel as if we are smelling the aroma coming from them. Serebryakova’s painting turned out to be surprisingly touching, poetic and spiritual. It is impossible not to be impressed by looking at these living sincere faces of children. In their eyes, we seem to see a reflection of their pure innocent souls. In such a manner, the artist created many of her works, it was her special style and handwriting. And when looking at the mouth-watering ruddy buns, we feel as if we are smelling the aroma coming from them. Serebryakova’s painting turned out to be surprisingly touching, poetic and spiritual. It is impossible not to be impressed by looking at these living sincere faces of children. In their eyes, we seem to see a reflection of their pure innocent souls. In such a manner, the artist created many of her works, it was her special style and handwriting. And when looking at the mouth-watering ruddy buns, we feel as if we are smelling the aroma coming from them. Serebryakova’s painting turned out to be surprisingly touching, poetic and spiritual. It is impossible not to be impressed by looking at these living sincere faces of children. In their eyes, we seem to see a reflection of their pure innocent souls. In such a manner, the artist created many of her works, it was her special style and handwriting.